PolluWatch encourages Montrealers to be more conscious about the environment by showing them their real-time impact. After our engineering's course on Sustainability and Development. We developed a deeper understanding of the different challenges humanity face. Our main concern should be around global warming and its immediate causes. After some preemptive researches, we discovered local weather stations don't provide us with real-time data on street-level in terms of air monitoring. That's how we came up with the idea of PolluWatch. 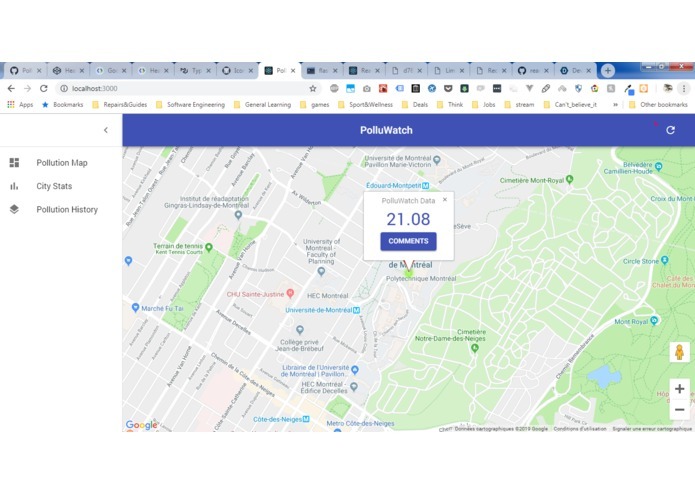 PolluWatch is web application that serves a heatmap of the different levels of pollution in the city of Montreal at street-level in real-time. It doesn't stop there however, the Air Monitoring Module's location is based GPS longitudinal and latitudinal data and can be as accurate as specific houses. 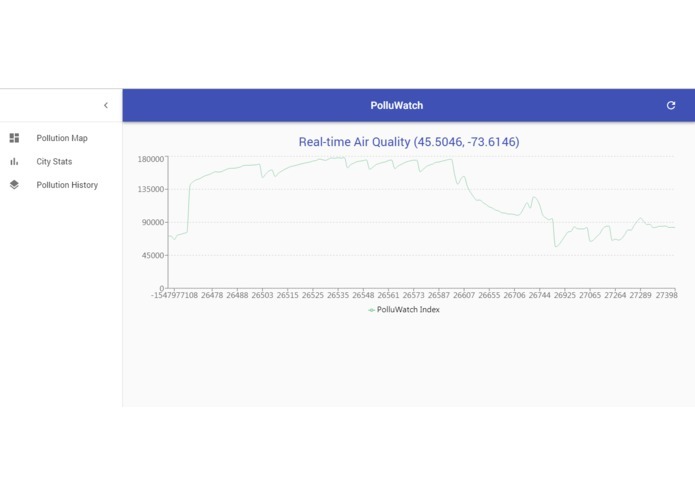 By getting data from our air monitoring modules and uploading it to our google cloud platform server, we're not only able to create the heatmap, but we're also able to provide the city with a lot of accurate air quality measurements. Our air monitoring stations are made of a cheap arduino-enabled board and an environmental sensor that computes the level of VOC (Volatile Organic Compounds) in the air. To process all these real-time data, we set up a Python Flask webserver that populates our SQL database which is then consumed by a front end written using React JS. Using Google Cloud Platform has been the only real challenge we ran into. Being all first-timers with the platform, we spent a lot of time dealing with parsing through the documentation to find the proper way to establish a connection with our server. Being able to finish this, make it pretty, and actually add all the advanced functionalities that we thought were "nice to have" really, really, really makes us proud! Additionally, the accuracy of the data as well as the precision of the location really surprised us. We mostly learned how to use Google Cloud Platform to setup an online database and create our own API endpoints to receive the data from the stations. The PolluWatch concept is extremely adaptable and has no real limit to the amount of sensor modules ones can use to gather data. This can come in handy to monitor the air quality around major cities giving access to real time data to all of its citizens, or can adjusted to be used to monitor private homes or farms. Tried to reproduce the entire hardware part of the project with the dragonboard. 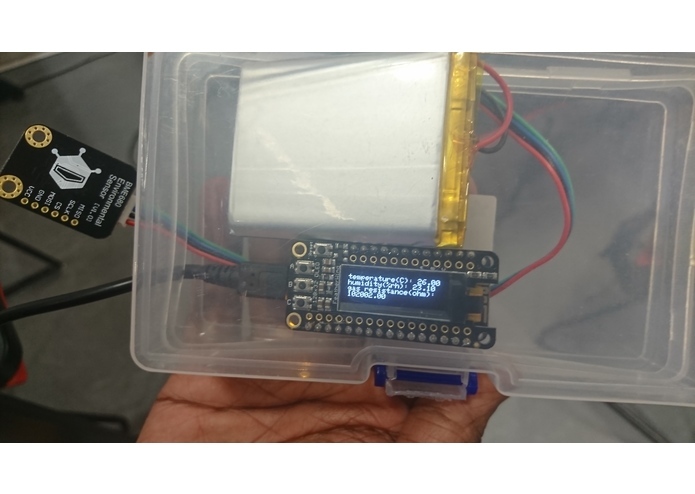 I handled all the hardware side, curating the sensor values and sending them in JSON from an Arduino/ESP8266 wifi module to our flask backend server. Built the Client React application, that fetches our sensors data, displays a pollution heatmap along with general air quality indices, and also draws a real-time chart of pollution levels in monitored locations.